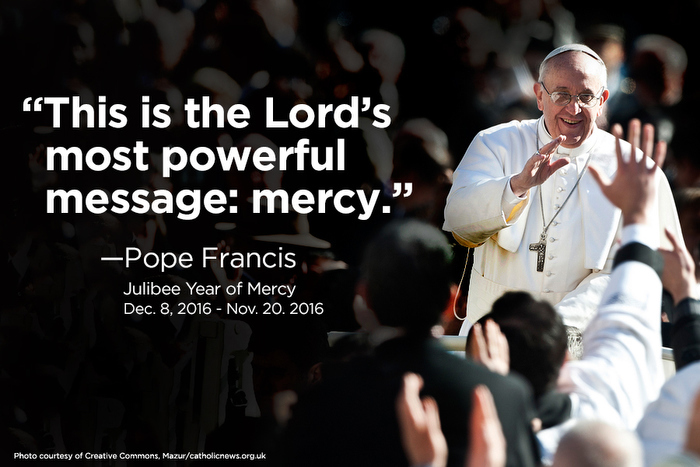 Seeing the great need for mercy and healing in the world, on the second anniversary of his pontificate Pope Francis called for the Year of Mercy—a special period, also known as a Holy Year or Jubilee Year, for the Catholic Church. It is a time for the Church across the world to take approximately a year to focus on forgiveness and healing in a special way. Pope Francis has asked us as individuals and as a Church “to be a witness of mercy” by reflecting on and practicing the spiritual and corporal works of mercy . Beginning on the Solemnity of the Immaculate Conception, December 8, 2015, and ending on the Solemnity of Our Lord Jesus Christ, November 20, 2016, the Catholic Church will celebrate a Jubilee Year of Mercy which will focus on studying and reflecting on mercy, receiving mercy, and being merciful towards others. May this guide serve as a collection of resources and links to help you celebrate the Year of Mercy.